A charming novel in the vein of The Wedding Planner featuring an ambitious and by-the-books event planner who finds herself at odds with her new assistant, who happens to be the son of her boss, on the eve of the biggest wedding of her career—from the New York Times bestselling author of The Runaway Princess and the Little Lady Agency series.The Bonneville Hotel is the best-kept secret in London: its elegant rooms and discreet wood-paneled cocktail lounge were the home-away-from-home for royalty and movie stars alike during the golden age of glamour. Recent years haven’t been kind, but thanks to events manager Rosie, it’s reclaiming some of its old cachet as a wish list wedding venue. While Rosie’s weddings are the ultimate in romance, Rosie herself isn’t; her focus is fixed firmly on the details, not on the dramas. She lives with a professionally furious food critic and works tirelessly toward that coveted promotion. But when the hotel owner appoints his eccentric son Joe to help run Rosie’s department, she’s suddenly butting heads with the free spirit whose predilection for the unconventional threatens to unravel her picture-perfect plans for the most elaborate—not to mention high-profile—wedding the hotel has ever seen, a wedding that could make or break not only the hotel’s reputation, but also Rosie’s career. 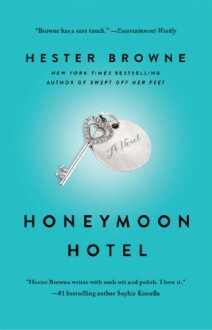 From the author whose books are described as “deliciously addictive” (Cosmopolitan), Honeymoon Hotel will reaffirm your belief in happily ever after.